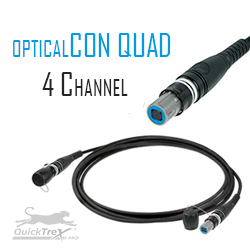 In years past, the use of fiber optics in the broadcast and AV industry was limited. Today with the adaptation from analog to digital data transmission, the industry has been adapting to widely use fiber optic cabling. However, conventional fiber connectors such as ST, SC, LC, etc. are not designed for multiple plug and play applications. 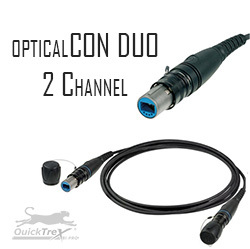 The end faces of these fiber optic connectors are vulnerable to even the slightest amount of dust, debris, or scratches, and are optimized for a one-time connection. They were never designed to be used in harsh environments, or to handle heavy mating cycles. Alternative military connectors can come with a high price tag. 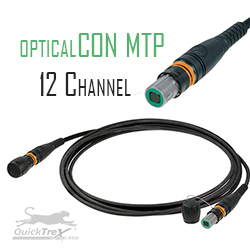 Neutrik® took these issues associated with mobile fiber optic connectivity and solved them with opticalCON® connector line which combines low maintenance, high mating cycles, and a safe connection in the field.